If you like ebooks but don’t like reading them on your computer screen, this How-to post is for you. I’ll show you a quick and dirty book binding technique you can use to turn your ebook into a real book with about 5 minutes worth of effort. In fact, this is so easy, you might end up self-publishing your own books on demand for profit. If that’s the case, you owe me a copy. Before we get started, I recommend you subscribe to my RSS feed so you don’t miss out on updates to this guide and other tips. This process involves just a few basic steps, no sewing, or doing mini-binds (otherwise called signatures). The most time consuming part of this process is just waiting for glue to dry.First, the problem: How many times do you print up a book or detailed report only to lose some of the pages, or have them fall out of your hands and jumble the pages? Since ebooks can contain several hundreds of pages, it’s easy for accidents to happen. You can’t read them if there is any wind blowing. You can’t pull them out 5 minutes before a meeting and turn to your bookmark. Even turning the pages becomes annoying after awhile. That’s why you should consider this easy DIY project. 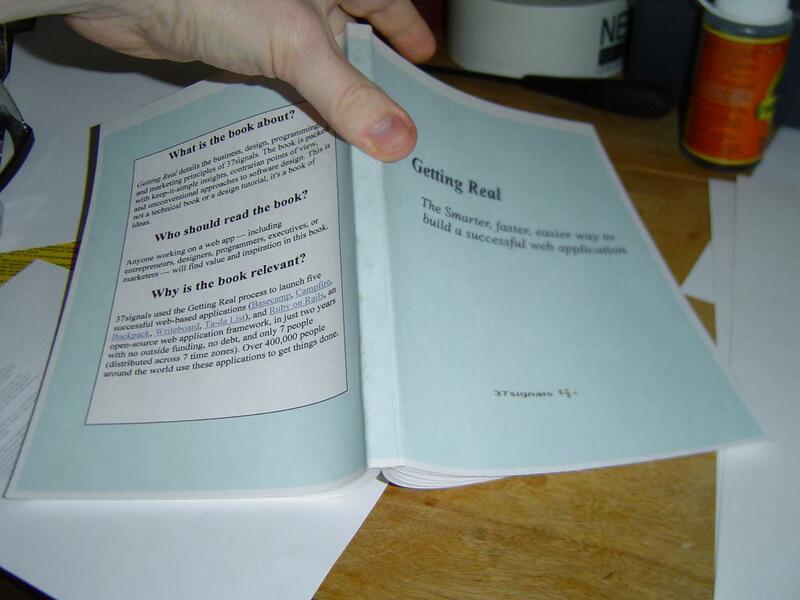 editor note: Hey, there’s now a full course on quick and easy at-home Bookbinding available! For the eBook, I purchased the 37signals new ebook Getting Real The Smarter, faster, easier way to build a successful web application. I was watching a show on TV last night and got a bit bored so I chose to bind the book while I was watching. Aside from printing and glue drying, the whole process took about 5 minutes. 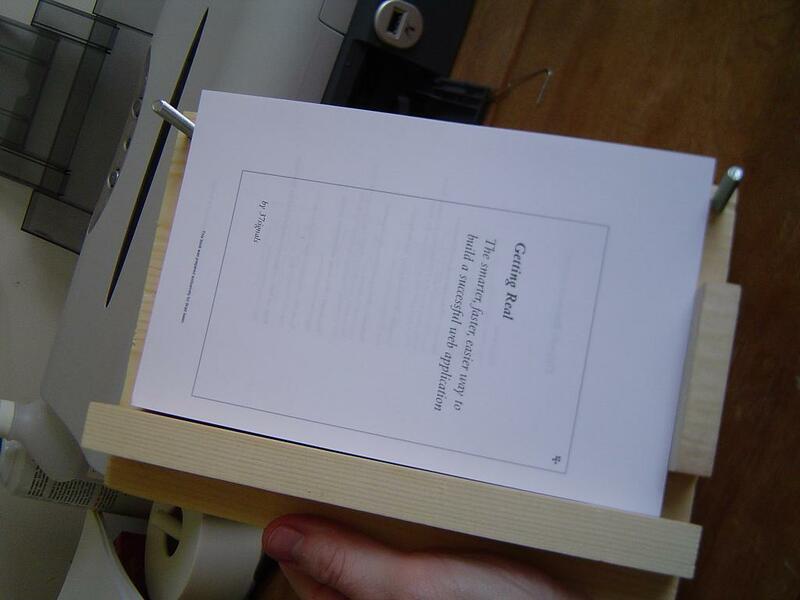 Print the ebook on A4 paper. A duplex printer really helps here. I actually get the full 8 1/2 by 11 sheets and cut them in half. Also, use a heavier 24lbs paper stock to avoid the ink bleeding through. Like a deck of cards, grab all your book pages and tap them so all the sheets are flat and in line. in line. Building a binder like this definately has it’s advantages. First the two blocks of wood keep the pages in line on two sides. Also, it’s very easy to clamp them using the clamp bar and wingnuts. Here are all the pages in the binder, isn’t this pretty? I clamped them tight so nothing moves. Wet the spine. 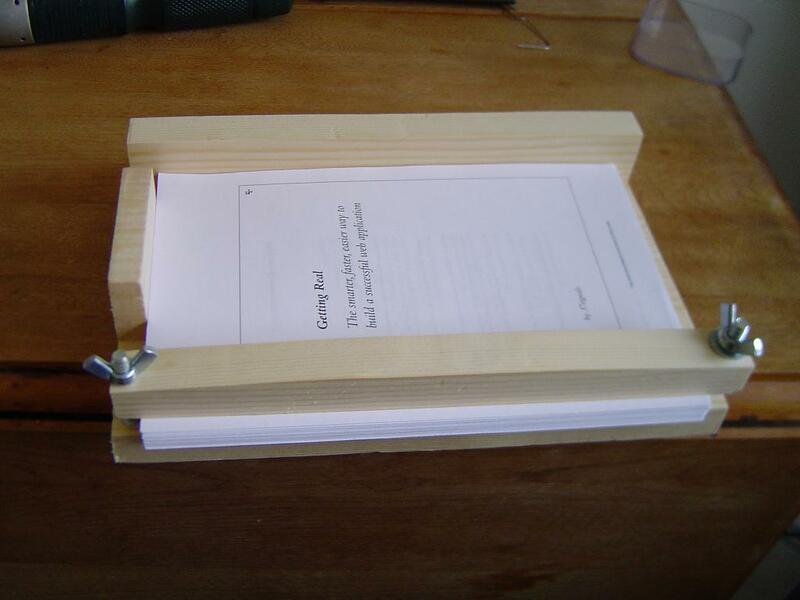 I use Gorilla Glue to bind the books. It’s great for several reasons. One it expands and fills in any unintentional gaps. Two it holds firm and tight. Part of me wonders if pro binders use it because it’s so solid. I use a cotton ball slightly wet with water to wet the spine. I make sure I make a pass or two over the spine so it’s damp. Then I squeeze all the water out of the cotton ball and use it to apply the glue. While the glue is drying, I measure out the cover. Typically, I use some heavy card stock in legal size. Since I’ve done this so many times, I have a word template for printing the covers. If people want it, I’ll post. It’s smart to go ahead and fold the edges of the cover before binding so it will fold over the pages without you having to strain. If you are going with pages 5 1/2 inches wide, then measure 5 1/2 inches and make a light mark on the cover. Then measure the width of the newly bound pages and mark there (In this case the page measure 1/2 inch.) Use a ruler to make the folds. 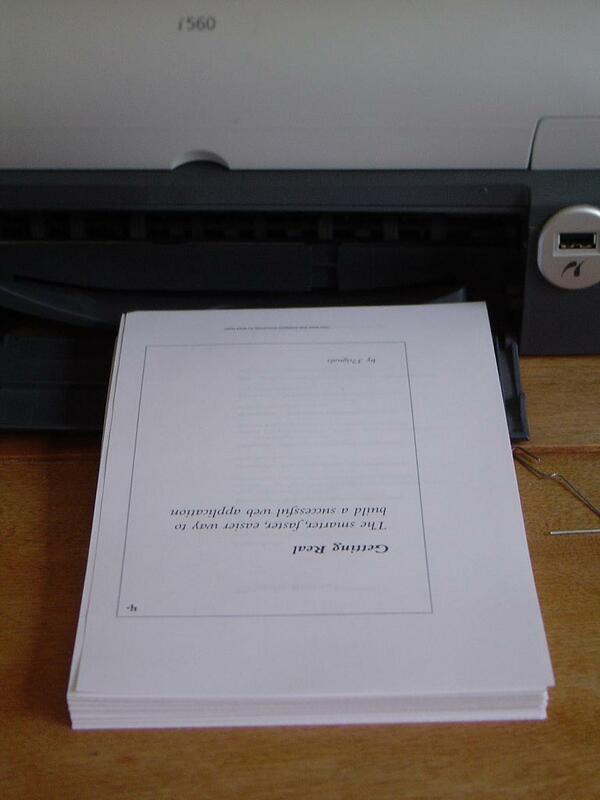 After the glue has dried, I loosen the wingnuts and insert the cover (back side) underneath the newly bound pages. After applying a touch more water and spreading glue to the spine, I fold over the cover and make everything tight. 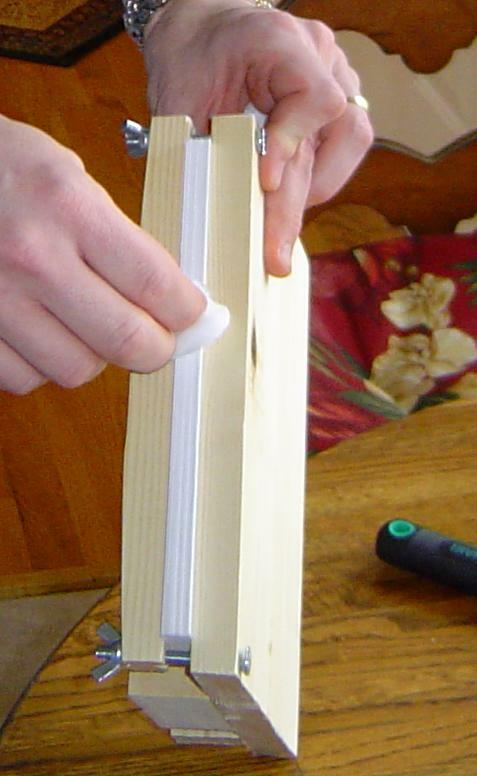 Then clamp it in the book binder. You can see an overlap in the cover. I tend to cut too large so I can cut back..it’s better to have too much than too little. Now just leave everything to dry – overnight is preferable. Ok, it may look like I’m ready to sit down and read you a story…but I am demonstrating the toughness of the binding. In this picture, I am really stressing the spine and binding. It still holds up and springs back into shape. 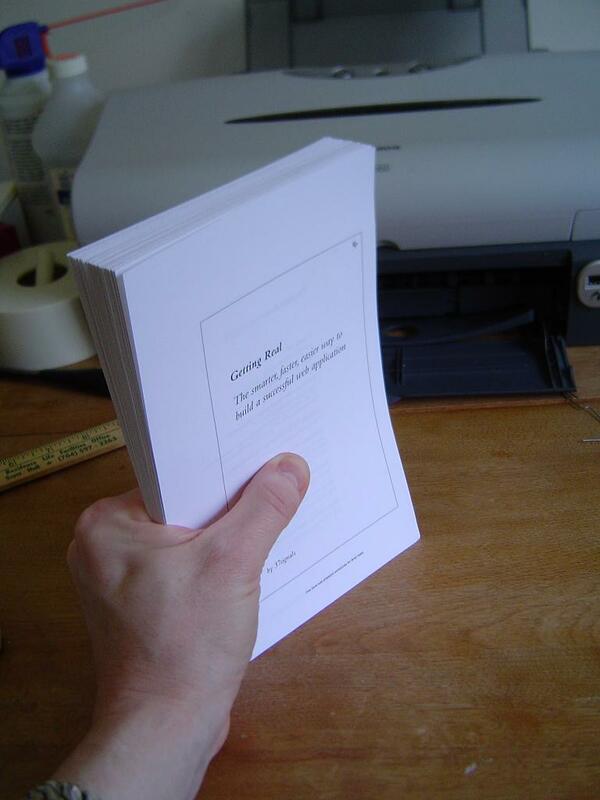 are printing it, why not go ahead and take the extra step and bind it? Now that that’s done…I’m off to read. Be sure and post your questions and comments. Yeah, sorry about that with the guide. It was something I produced for printing and giving away. Posting it for others was an afterthought. Thanks for the suggestion here of Gorilla Glue. I’ve been using Bostick All Purpose adhesive, and it’s really fumey when it’s first applied. Binding — or huffing? A4 and A5 are sizes defined by ISO and very common in Europe. Thanks for the tutorial. I was silly enough to claim that I could make some journals for retail before I knew how to bind. But I am much more confident now! I love this I’m going to print it out and try it!!!! Some of the things (zines) I have need to be bound. I love that you have pics; for people that need to see what you’re talking about… like me… you rock! This looks awesome. I’m going to Home Depot right now to pick up some jig supplies. Also, Brad, how did the pics of that adjustable jig seem? I’ve been thinking about book binding ever since I was little and read Inkheart, by C. Funke, but I finally decided to bind my own sketchbook. These were the best instructions I could find! Thank you! Hi Katie, you’re welcome. Glad you like the instructions. Hope you’ll hang around – I’ve got some other ideas to share. Thank you for this simple, very interesting, very applicable and very easy to understand tutorial. Some minutes ago I was just searching for such an article. May God answer your attempt! Thanks for great Information. I will do this to my favorite ebook. I’m so happy I found your site. It’s just what I’m looking for. I write books just for my new grand nephews and my grandniece. My sister gets them bound at Staples with those plastic things but I was looking for something a little more traditional and that I could do myself. Thank you so much. Thank you for this beautiful idea. I love this idea! I can’t wait to try it. I can’t seem to find a cover/binder template. Can you send me a link to one or something? this is great. i’m just starting to homeschool and using free curriculem from http://oldfashionededucation.com/ . I was going to download all the books onto my old pda for my boy, but he said alot of the books just wern’t big enough, especially those with pictures. This will be alot better than printing and putting into binders. Will be alot cheaper also. Very useful tutorial, found it today, bought all the supplies for a jig, put it together, and bound a book in less then 2 hours. cost me less then $20 for all the supplies. I just wrote a booklet that I’m going to publish myself. I ran across this site and I’m going to try this method. Where’s a cheap place to buy gorilla glue? How much does it cost? Does the dampening step work with photo paper? The paper feels like plastic. I am under the assumption that the moistening of the paper expands it? What is the reason for this step and will it work on photo paper? Thanks for the blog and sharing your success. I’ve been binding paperbacks for about 3 years and it never occured to me to check to see if there were any tutorials about to see if I could improved the procedure. 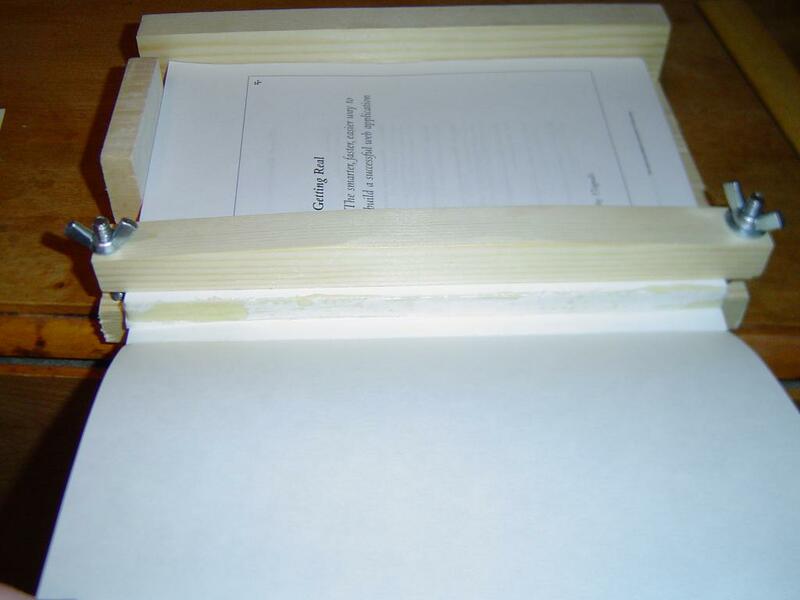 I have a book press (fashioned using old pine shelves, coach bolts and wingnuts) and use PVA. Is gorilla glue available in the UK? I can’t seem to find it. Also, what kind of cutter do you use and where can I get one as cutting is the only thing I have to go a print shop to get done. Great tutorial, by the way. Wetting the pages never even occured to me. Thank you!! I’ve been hunting round for exactly this info for ages! I have no idea what gorilla glue is (made from gorillas, or is it a brand name? – I’m in the uk), but will try using pva. nice also to see there are plenty of us out there, making sure the book will never be out of date! LOVE this! I started making my own sketch books awhile back and this is an amazing way of doing it! Building a clamp for them this weekend. Thanks so much for this… i was looking for a quick way to bind a gift for a friend… the pictures of your wooden binding thingy were awesome and a great way to go about it! 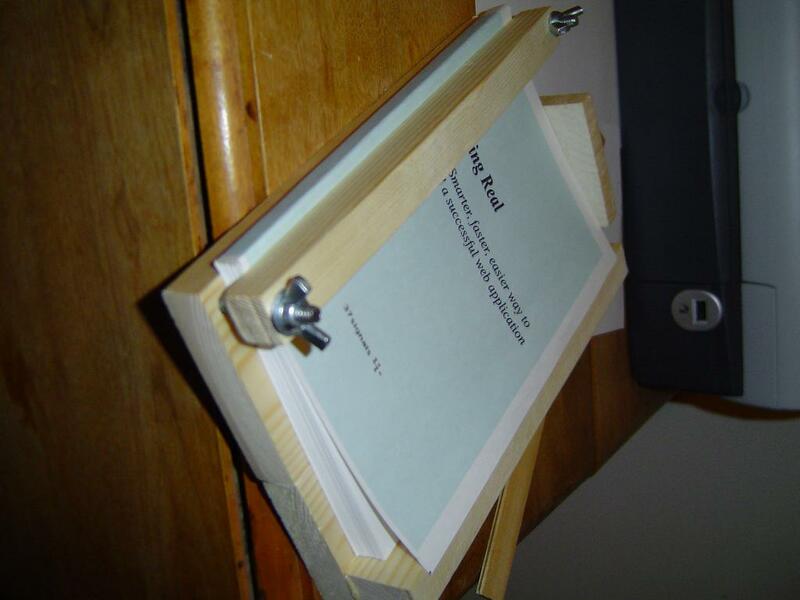 I was wondering if you could tell me how to make one of those nifty book binders you had… It would be much appreciated! If you have a blog or website, I’d appreciate a mention if you have the time. Please post the cover template. Can you direct me to a source of cover material? I would like something with a texture and really heavy stock. I love it! I am writing a series of books for my granddaughters. these books will be illustrated by me in watercolors so I want them to be done well so they can pass them to their children. I racking my brain on how to bind them nicely. I also love the book binder you made. Thank you so much! .-= Diana Figueroa´s last blog ..Fancy Feathers =-. Wow, this is awesome. This is going to come in handy for my classes. I save money and just buy the chapters I need online and now I can bind them together! Sweet. Gorilla glue really is some amazing stuff. Give the Gorilla tape a shot and you’ll never go back to regular duct tape. I’m going to try this with smaller paper to make more of a paper back sized book. Thanks! .-= Eric´s last blog ..High Quality Portable Audio Setup On A Budget =-. Awesome instructional! Thanks for taking the time to post it! I made my book-binding press yesterday and made a book today. That gorilla glue really is great for this application. I also used some “Hollander’s Bookbinding Glue – Standard” for part of the process. The Hollander’s dries clear as opposed to the gorilla glue which dries white. Just my two cents. Nice tutorial; thanks. For those asking about gorilla glue, it’s a brand name for polyurethane adhesive, often sold as a woodworking glue. Excel glue is another brand name. If your hardware doesn’t have gorilla glue, they’ll probably have some other polyurethane adhesive. Just wanted to know if original Gorilla Glue dries clear, or if I should try the kind that dries white? The original GG dries beige, and I haven’t tried their white. But does it matter? The glue is hidden within the binder. Hey Brad. Good stuff here. I was wondering if you had any troubles with the paper curling after it comes from the printer, or is that another benefit of the heavier stock paper? Eitherway, if you did, how did you combat it? Dex, the heavier bond paper does prevent more of the curling. It’s never been much of an issue. Plus when you put the cover on the book the cover seems to straighten everything out. Thanks Brad! I don’t know how into DIY crappy philosophy books you are, but you’re getting one!! .-= Dex Ter´s last blog ..F Nice Records, Inc. =-. Do you have a list of all the materials needed? When folding the book cover edges, it’s helpful to “score” the folds with a razor blade before you fold them. I take a ruler, line it up along the future crease, run the razor blade lightly but hard enough to cut the top layer, then fold along the cut. It folds super straight this way. My company has made some technical training books available to us that are in PDF format. We can also duplex-print them on state-of-the-art color laser printers. So far, so good. What is not so good is that the loose-leaf binders we have been using leave a lot to be desired, especially since in some cases the punched-out holes obliterate bits of text. I came across your article and built an almost identical jig and was amazed at the results. Thank you for making this information available: it really works! Great info but waiting 24 hours to dry really slows down production even if one is interested in producing 10 or twenty copies. Any way of increasing the speed for drying? Just stack the books as you make them and put a phone book on the last one in the stack… you don’t need to wait 24 hours between each book. Thank you Brad for your patience. I’m assuming if one purchases paper, ink, glue and all necessary supplies wholesale then adds sweat equity, a small profit can be derived. Anyway, I appreciate your site which is informative and very clearly laid out. Kudos! Wonderful tutorial. Professional book binders do not use Gorilla Glue, we use PVA because it is archival (it won’t damage or yellow the paper). Thank you so much for this excellent tutorial. I’ve been checking the internet for some really decent instructions to bind a book and these directions are extremely easy to follow. I’ll be saving and printing this tutorial. Thanks again for your time and effort to produce them. 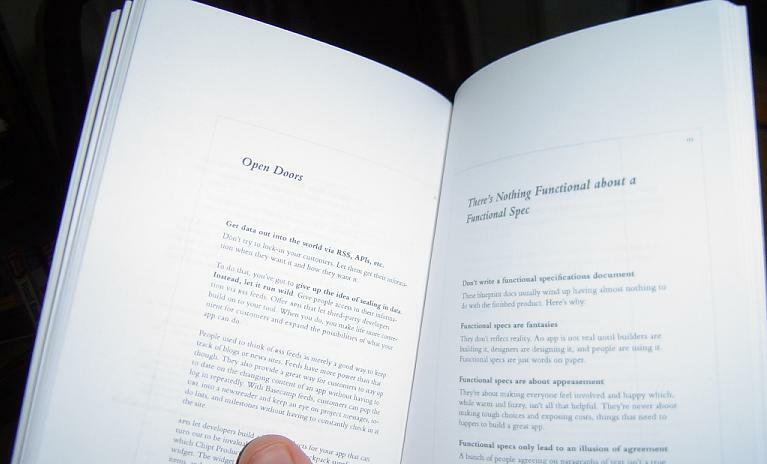 When printing up the pages I’m using a 1″ margin on all sides. How much additional margin do I need on the spine side for the glueing so the 1″ margin remains in the bound book? Thanks! Great post – I love DIY! Just finished binding my book today, and thanks for taking the time to post these easy directions. What is the secret for custom covers?